It never ceases to amaze me how much homemade pasta brings out a person’s’ wow face. You know what I mean, that “oh-mah-gawd-you-mean-you-didn’t-buy-this-pre-made” look, the one that makes you feel like you’ve reached the outer limits of culinary possibility, that you’re the equivalent of a rocket scientist in the kitchen. Err, no, I promise it’s not like that. I can barely tie my shoes; I swear making your own pasta and noodles isn’t a complicated procedure. It is, however, more time consuming. 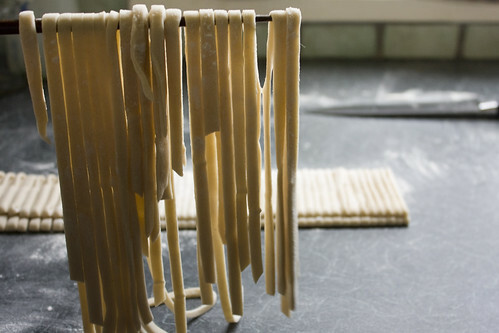 These homemade noodles take a few hours, though most of that time the dough lies dormant, on its own, while you’re off getting on with the rest of your morning. Go take a nap, go to work, or do whatever it is you people do when you’re not noodle-making. Draw pictures, send me an e-mail. Whatever. My point is, these home made udon noodles are easy. Your total manual labour time will shape up to just 20 minutes or so, and it’ll be worth it in the end. The trick with cutting the noodles is to use a lot of flour so they don’t stick together when folding them. Why bother folding? Because it’s just easier that way, allowing for shorter cuts when you whip out your knife to cut the dough. Use a sharp chef’s knife, something that will cut swiftly and distinctly through the dough to avoid anything sticking. The sesame oil is an optional ingredient, but I like the mild flavour it imparts. If you’re planning to use the noodles in a very basic dashi or miso broth, I’d recommend its use. If you’re using the udon in a dish with a more complex flavour profile then it’s probably a safe bet to say you can skip the sesame. Mix the flours and salt in a large bowl, making a well in the centre. Add all of the liquid ingredients to the well and fold the flour over to mix. Knead the dough for ten minutes, either by hand or using a bread kneading attachment in a stand mixer. The consistency of the dough should be quite firm (at first it may not seem like there’s enough water), but soft enough after kneading to be able to roll out. You may need to vary the amount of water you use slightly. Knead the dough down into a flat disk, an inch or so thick, and cover with cling film. Leave for a few hours. On a very well floured surface, roll the dough into a long 1/8 inch thick rectangular (ish) shape. Make sure there’s plenty of flour both beneath and coating the top of the dough at this point. 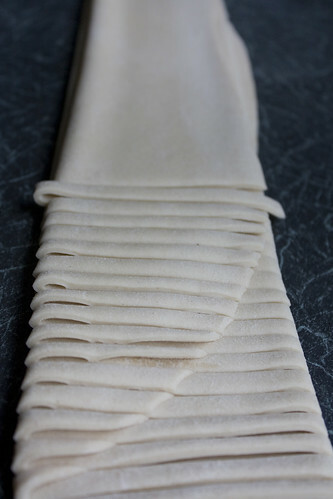 To make the noodles the easiest thing to do is fold the dough into thirds and slice. To do this, fold one of the long ends 2/3 of the way over the width. Pick the dough up and fold the remaining third of the dough underneath. Slice into noodles as thick or thin as you like. Boil for 8-10 minutes and use immediately. I still think you're crazy, but I love you. those are some good looking udon right there, good job! to get from a good udon recipe to a mind-blowing amazing udon recipe requires handmade noodles, i think. the best udon ive ever had were served in nagoya though. i still cant replicate them, i wonder what their secret ingredient is? Thanks! And I agree about homemade noodles making a great recipe better. I've seen some recipes with tapioca and other starches, so I want to try that sometime too. Woah. I wish I had the patience and ability to make homemade pasta! It looks great! Have you ever tried drying them? I am a full time student with three kids, time is a preimum! 🙂 So I was wondering if I could make a HUGE batch and then dry them to just pop in what ever recipe? If not, could “set for a few hours” be in the fridge till I could have time to cut them (something is always happening so it ends up being hard to get back to things…)?